In Sunday’s OC Register (Unions to Blame) is a powerful opinion piece by Cecilia Iglesias, one of the five Trustees for the Santa Ana Unified School District. Recently the Board of Trustees voted 4 to 1 (with Trustee Iglesias as the sole dissenting vote) to send layoff notices to 287 teachers. Why? As Trustee Iglesias points out, the District has had declining enrollment since 2002 and is continued to have this for years to come. What did the teachers’ union and their paid for board majority do in response to this situation: raise teacher pay and ignore basic mathematics. Over the last four years teacher pay in SAUSD has risen over 16% while the projected enrollment figures continued to slide. Remember – schools receive their money from the state (and the federal) government based on enrollment. So even using Common Core math could not save the teachers’ union and their paid for Trustees from fiscal reality – they don’t have enough money to pay all of their teachers (and other staff too) at the current levels. So they voted to lay off 287 teachers (the actual figure may be less come this fall – but still a significant number). What will happen from this lay off? First there will be fewer teachers to staff the classrooms. Result: pack the children into more crowded classrooms putting more pressure and responsibility on those teachers that remain. So for example a class with 25 students will grow in size to 30 or 35 students with one teacher. And which teachers will be laid off? The union contract with the school has a “last in, first out” clause – meaning the younger teachers will lose their jobs while older ones keep theirs. And there is absolutely no ability for the District, under this contract, to take into account a teacher’s performance (or lack thereof) in choosing which teachers to lay off. So who wins in this situation? Obviously union bosses who keep their positions. Older teachers who may be great teachers but there is still no way to judge if all of them are the best performers or not. The four union elected (paid for) Trustees who owe their seats to unions who underwrote their election efforts. Do parents and students win – Not by any reasonable measure. In fact it can be correctly argued that the District and the union are balancing the books on the backs of the children. The teachers who are laid off? The only way they “win” in this situation is if they find a job in another District that has Trustees that look out after students and parents more than teacher union bosses. Only if that District cares more about teacher performance than seniority. I wish all those teachers who are laid off well and that they find better replacement employment quickly. How will the parents win in this situation? 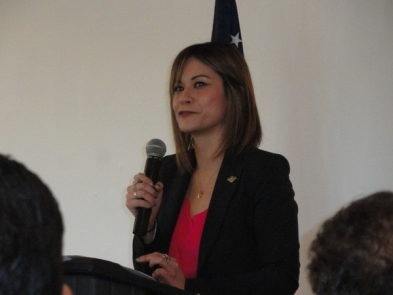 Very simple – put better Trustees on the board to join Ms. Iglesias to form a pro-student, parent and teacher majority that returns the focus of the District to the best education possible rather than catering to the desires of union bosses. End Of Forced Unionization For Government Employees? In today’s Orange County Register former State Senator Gloria Romero discusses a pending case where several public school teachers have sued the state and the California Teachers Association (CTA) challenging the Plaintiffs being forced to be in a public employee union in order to have their jobs as teachers. The case (entitled Friedrichs, et al v. California Teachers Association, et al) was pending at the 9th Circuit Court of Appeals. However, the Court granted Plaintiff’s attorneys’ motion to affirm the trial court’s findings against the Plaintiffs without the need for an oral argument. Part of the reasoning, according to Senator Romero’s op ed piece, is the 9th Circuit recognized that only the United States Supreme Court can overturn its own prior decision of Abood v. Detroit Bd. Of Ed. 431 U.S. 209 (1977). This has significantly sped up the appeals process hopefully getting the case before the Supreme Court (and a decision from it) by over a year – as early as 2015 or 2016. A few months ago the Supreme Court issued an important decision in Harris v. Quinn which I posted a blog about on July 1st (Harris v. Quinn, an Important Limitation on Forced Unionization). I noted that while the Harris case did not overturn the Abood case or declare that all government employee unionization is not lawful, the Harris court majority noted serious misgivings about the Abood cases’ underlying rational and the public policy of allowing government employee unions to require people to join them (and pay dues) against their will in order to keep their government jobs. Senator Romero also noted this about the Harris case in her op ed piece. Here is a link to her opinion piece (which is not behind the Register’s pay wall): Union-dues case moves closer to Supreme Court. I highly recommend you read her article. The Supreme Court is not required to take and hear Rebecca Friedrichs and her friends’ case. But I certainly hope it does and I hope the Supreme Court overturns Abood allowing government employees to make a voluntary choice to join a government employee union or not as they desire. I hope the Court recognizes that when someone is forced to join a union by operation of law and forced to give the union money to spend in ways that employee may not agree with, this is a violation of the 1st Amendment of the Constitution. Liberals always complain about wanting people to be able to make their own choices. A decision by the Supreme Court to end forced unionization of government employees, would be a victory for individual liberty and freedom. Finally, I have met Rebecca Friedrichs and her husband. They are wonderful long serving teachers who love their profession. If you ever have the opportunity to hear her speak on this subject, you will find a person of passion on this issue and a fighter who is not afraid to stand up to the unions and their bullying tactics. I wish her, her co-plaintiff teacher friends and their legal team well. Craig P. Alexander, Esq. is an attorney who practices law in the area of insurance coverage, construction defect, HOAs, business dispute and general civil litigation. His office is in Dana Point, California. When I decided to become a Candidate for Capistrano Unified School District, Trustee Area 4, I knew I would want to let people who read OC Political know why I am running with a post to this blog. However on Monday (10-6-14) Mr. Robert Loewen of the Lincoln Club of Orange County published in the Orange County Register an opinion piece that does an excellent job of summing up the reasons I am running and why my friends current CUSD Trustee Ellen Addonizio (running for re-election to Trustee Area 6) and Julie Collier (running for Trustee Area 7) are running and what is at stake in this race. Mr. Loewen’s title for his opinion is Support Accountability at Capistrano Unified. Suddenly, Jack was no longer confused. The signs were a mean-spirited rebuke to a project proposed by his mother, Julie Collier and some other parents, who wanted to see if they could use innovations allowed by state charter-school law to improve the learning environment for their own children. So Jack found himself in the middle of a protest by someone who used kids to make their point. Jack threw his sign on the ground. Smiling, his teacher came over and handed it back to him. “Jack, could you hold up this sign again? I want to take your picture.” Click. Jack’s mother, Julie Collier, is running for a seat as trustee on the Capistrano Unified School Board, Area 7. For Julie, it’s personal. She doesn’t mind discussing the issues of accountability and allocation of limited funding in education with anyone. Thank you Mr. Loewen for an excellent article. For more information about my friend Julie Collier and her race go to Julie Collier for CUSD. For Ellen Addonizio go to Re-Elect Ellen Addonizio. Julie, Ellen and I respectfully ask each voter in Trustee Areas 4, 6 and 7 for their vote. Thank you all for your support. The Orange County Register published an article scrutinizing the Assembly candidates biographies, but candidate Ling-Ling Chang education claims gets top grilling. The view of the article is behind a firewall, which requires payment to have reading privileges. It has been reported in previous campaign materials, publications and city of Diamond Bar website that Chang earned a degree in Biology from UC, Riverside and attending Harvard. However, the article explains on the contrary that Chang has no degree in biology, which means she dropped out of UC Riverside and Chang explained that she is doing her studies “online” for a degree from Harvard. Sadly, Chang offers no apologies for attending Harvard, but she should be reminded that attending an Ivy League university physically on campus is totally different than one taking courses behind a keyboard. Unfortunately, Chang faults the inaccuracies to the City of Diamond Bar Public Information Officer, which is an insult to the professionalism of a municipal employee that is of high regard in and out of Diamond Bar City Hall. If an Assembly candidate spends all of the time going to meetings as a councilmember on the taxpayers dime should have gone to night school and gotten a degree instead of polishing a political résumé for far too long. It is ironic that an Assembly candidate is using SCA 5 on a campaign platform who only holds a high school diploma. We are in a midst of a campaign season and candidates should be grilled until Election Day. As for one candidate to embellish education claims brings bad taste who is being endorsed by high profile Republican elected officials such as Rep. Ed Royce and Senate Minority Leader Senator Bob Huff. The voters in the 55th Assembly District deserves the truth as to who will be their next Assemblymember. It is good to know now than with regrets for the constituents who could be stuck with a legislator for the next 2 or 12 years. Kring is a Conservative Republican; Brandman is a Liberal Democrat; Why Doesn’t OC Insider Seem to Care? OC Political readers have already seen a couple of Anaheim council candidate Lucille Kring’s mailers, which make it clear she considers Democrat Jordan Brandman her biggest competition. She’s hitting him for being a Democrat and taking union money, both of which are true. First off, OC Insider seems to be having literacy issues, as it isn’t the Kring campaign that’s sending those mailers, it’s the Republican Party of Orange County. Kring is one of the Republican Party’s officially-endorsed candidates, and Brandman is officially endorsed by the Democratic Party of Orange County. It’s the Republican Party’s job to elect Republicans and defeat Democrats, just like it’s the Democratic Party’s job to elect Democrats and defeat Republicans: it’s that simple! Kring got $500, Brandman got $20,700. Brandman got more than 41 times the union money that Kring did. Who on earth could be bought with $500? But $20,700 is a nice chunk of change. And who knows how much more Brandman is getting in union IEs. Kring is officially endorsed by the Republican Party of Orange County, the Orange County Register, and Mayor Tom Tait. Brandman is officially endorsed by the Democratic Party of Orange County, numerous labor unions, and Congresswoman Loretta Sanchez. It’s that simple.